Embark on the ultimate winter adventure on one of Mt. Washington Observatory’s Summit Adventures. 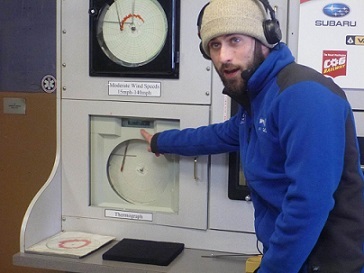 These thirty-six-hour experiences put visitors right in the middle of the world’s worst weather and offer curious adventurers a behind-the-scenes look at the crucial meteorological and climatological work performed in the mountain’s Observatory. During the winter, the Observatory offers both day trips and overnight “EduTrips”. 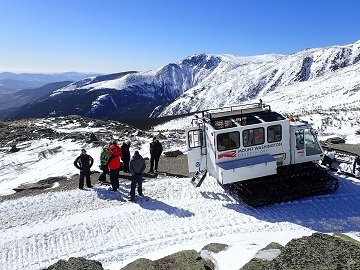 Visitors travel to and from the summit in a heavy-duty vehicle known as a “Snowcat”, originally designed for use on high-angle ski slopes, and get the opportunity to experience the arctic conditions first-hand. Participants choose from course topics ranging from basic meteorology to mountaineering to yoga, all taught by experts in the field.